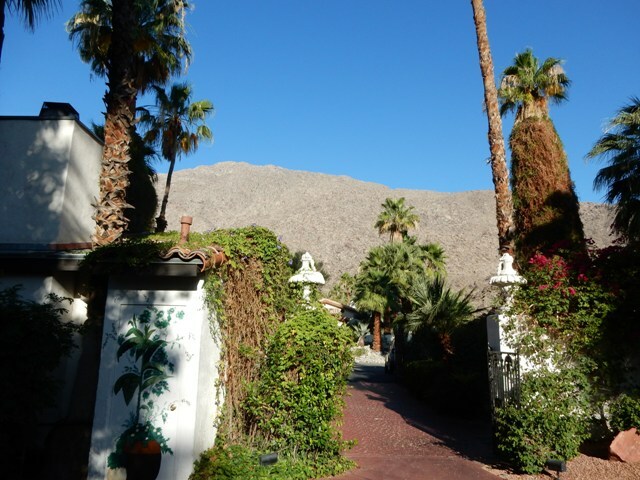 Clouds of star dust hover over the deliciously eccentric Ingleside Inn in Palm Springs, one of the most authentic boutique hotels on the planet that dates back to the Golden days of Hollywood. Chilling out on the swing veranda seat, exploring grounds whose romantic villas hide behind lush vegetation or lounging at the secluded poolside you are more of a cherished private house guest than a hotel customer. 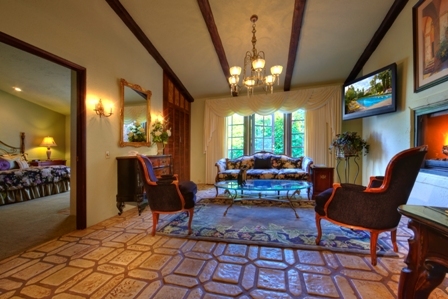 Greta Garbo slept here regularly as did Salvador Dali, Clark Gable, Greer Garson and a host of stars of yesteryear. John Travolta, Arnold Schwarzenegger, Goldie Hawn, Sylvester Stallone, Liza Minelli were more recent guests who came to relax and unwind. 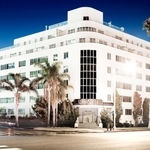 During my recent stay I just missed sipping cocktails next to Lily Tomlin and Debbie Reynolds (a regular) in the Casablanca lounge. But I did manage to hang out in the bar at Melvyn’s, the Ingleside dining room/restaurant/cocktail bar next door with Kinks drummer Mick Avory and his entourage over from the UK. 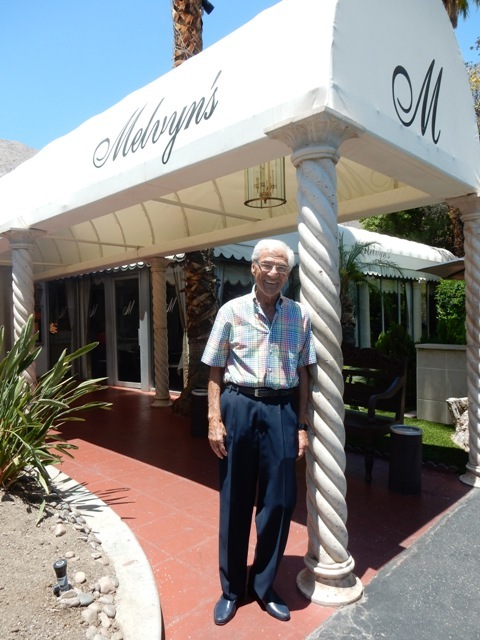 “ I first came to Palm Springs back in the 70’s when the Kinks were in Los Angeles, so a lot of great memories are here and you step back in time to the Hollywood golden days here at the Ingleside and Melvyn’s” he told TripReporter. Minutes from the heart of downtown Palm Springs, entering the short Ingleside driveway on 200 West Ramon you are transported into another world – an era of glamour and crushed velvet pampering- amid the rambling collection of low slung Spanish style buildings swathed with vivid pink and purple Bougainvillea. The Ingleside’s owner since the mid 70’s, suave and entertaining Melvyn (Mel)Haber, a celeb in his own right who has written books about his encounters with the stars and ‘you couldn’t make it up’ exploits, cautions ” the beauty of this place is that there’s nothing to do. So whatever you are doing or not doing, that’s OK”. Forget about a procession of bellboys and spas offering mind boggling rejuvenation cures at the Ingleside whose passing blink at a spa is its stone built Jacuzzi next to the outdoor pool. 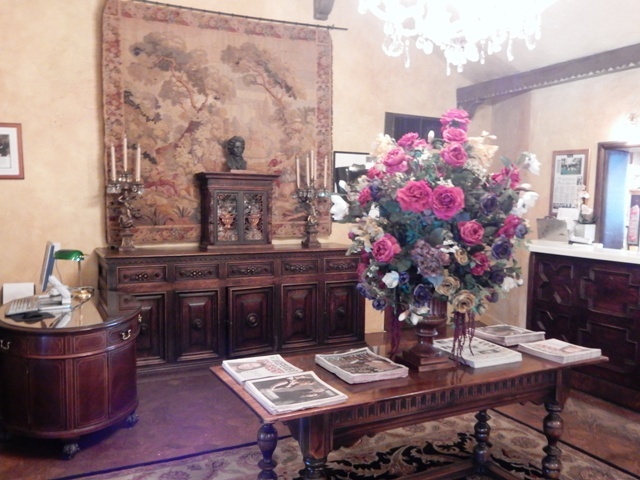 Guest luggage is looked after efficiently by old retainers on arrival amid an eclectic mix of European and Asiatic objects d’art in the splendid salon-reception area. Smiling and forever helpful Armida is more the gracious hostess inviting weekend guests to a house party than a hotel receptionist. She has worked here for years, knows all the celeb stories, clandestine trysts, bust ups and scandals. But naturally her lips are sealed. My mini suite room 144 named ‘The Floral’ was once occupied by Marlon Brando who spent most of the time when he stayed in his camper van out back chatting anonymously with other ham radio fanatics on CB radio. The marble mantelpiece in my drawing room was vintage Downton Abbey and the leaky shower, in need of a 21st century overhaul, harked back to those same days of elegance and dicey plumbing. Panic set in when I could not locate the fridge at one of several normal hotel suite locations. After a hunt I found it generously filled with complimentary bottles of water, soft drinks and fruit hiding inside a walk in wardrobe. Off the chintzy retro bedroom was a small secluded patio, with nothing to disrupt one’s view of those gorgeous vertical San Jacinto Mountains, framing bright blue cloudless skies. The spot was so quiet that the butterflies flitting from shrub to shrub sounded noisy. 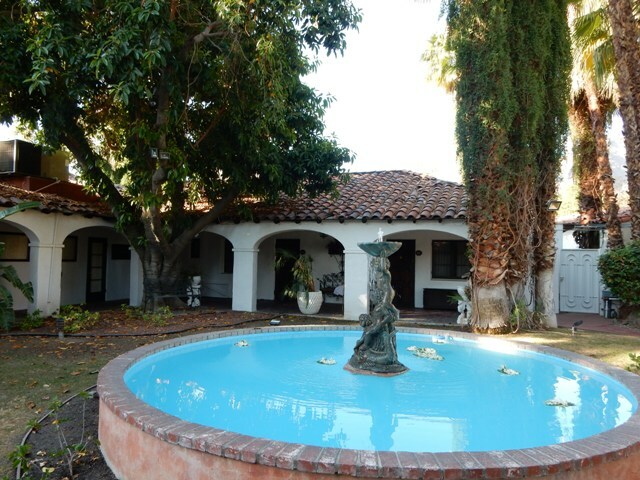 A hacienda style courtyard led around to parking behind a back entrance, useful for those discreet comings and goings by celeb guests. A past winner of many awards, including one for having one of the most romantic settings, The Ingleside’s 30 rooms includes mini suites, villas close to the pool area and one flight up mountain view accommodation. Padding around in my swimming gear in the welcome cool of early morning a fountain bubbled outside my door, a vintage Rolls-Royce was parked out front, plus a couple of fifties Elvis Presley film prop automobiles. At the secluded swimming pool ladies of a certain age looking trim and well kept were already lounging, their faces hidden from wrinkle giving rays under wide brimmed hats. A prominent notice at the pool forbad any “horseplay”. Ingleside Inn guests are invariably enticed to thread the celebrity worn boards of Melvyn’s adjoining restaurant. Morning ‘eye openers’ included Melvyn’s famous Sausage Maison omelette and Oyster Rockefeller (“the aristocrat of oysters, baked with our special Pernod with spinach topping, glazed with hollandaise sauce” $14,50)accompanied by endless champagne at $9. Frank Sinatra had his own table at Melvyn’s back in the day and so did other Rat Pack members and Hollywood greats of the era. And still they come, the newer kids on the block including the likes of Tom Cruise, Adele and Katy Perry. Hand on my heart I have eaten a far better filet mignon elsewhere in the US and Europe. But the ambience in Melvyn’s took some beating in that ‘you never know who could drop in’ league. Another cachet is the live entertainment 7 nights a week and fun in the club like atmosphere of the Casablanca lounge. Be sure to catch a Sunday jam session – they are renowned in this desert oasis – with a deluxe champagne brunch first. I want to stay at the Ingleside Inn. How much is it? The Ingleside Inn (prices vary according to the season but on internet sites can be as low as $120 per night in a double de-luxe room) see .